Thanks to American Personalized Products I got to review some of their great products! I got the bookends set, a trivet and a bookmark! I love these personalized products! The book ends look great on my bookshelf! The trivet is awesome and really good quality! And I also love the bookmark! Thanks American Personalized Products for the great products! 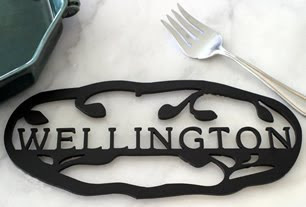 Customize your dinner table with their decorative Personalized Trivet. Their Trivet is made of durable steel with a high-temp powder coated finish. Personalize it with the name or saying of your choice so that when it is not in use you can display it for everyone to see. Our personalized Trivet makes a great Mothers Day, Christmas, Housewarming or Wedding gift. Dimensions:12 1/4" x 5 1/4" x 1/4"
These Book Ends make the perfect gift for any reader or just the finishing touch for any bookshelf. Our Initial Book Ends can be ordered with any initial you choose and what a thoughtful way to let someone know you are thinking of them. 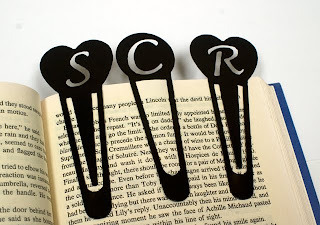 Their heart shaped Bookmark is a must have for any reader. Customize it with any letter and you will have a fun and heartwarming gift that will be forever cherished. The lucky recipient of this personalized gift will think of you every time they pick up their favorite book. Our Bookmarks are made of durable steel and will hold your spot perfectly. They are proud to offer their customers a group of well-crafted, personalized gifts, created to make gift giving a unique and thoughtful experience. American Personalized Products is your source for unique personalized gifts for every occasion. Personalized gifts are the perfect way to show that someone special you truly care. Their best-selling Personalized Fireplace Grate was featured on The Today Show in December 2007 as one of the top ten Personalized Gifts of the season. Their gifts make memorable Wedding, Mothers Day, Fathers Day, Anniversary, Housewarming, Birthday, and Christmas gifts. Each product is carefully created by using fine plasma cutting technology, which utilizes magnetically charged gas as a cutting mechanism and delivers a precise rendering of your order. American Personalized Products is a division of American Steel Fabricators located in beautiful, rural Greenfield New Hampshire. Since 1992 American Steel Fabricators has been a leading miscellaneous fabricator in New England for sales, service and customer satisfaction. They credit their ongoing success to a dedicated, smart and hardworking group of employees. They all understand that quality is what matters and strive to give and produce nothing but the best in all of their products. American Personalized Products has been operating since 2002. They started with a line of Personalized Fireplace Grates. The word spread and soon they had so many requests for the product, American Steel Fabricators officially opened a new division. They have been adding products ever since and have discovered that their customers love being able to own custom products! 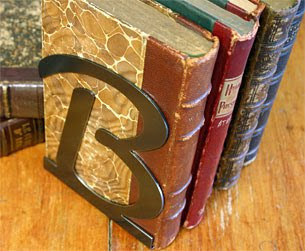 bookends, a trivet and also a bookmark! I would LOVE all those! Please enter me! I always love the stuff you giveaway!! I continue to wear your buttons! I need some bookends - these are great! How seriously cool is that! I love all things personalized and monogrammed! Pick me! Please add me. This is a really nice giveaway! WOW! I really thought the bookends were wonderful. Then I saw the trivet. OH BOY! I love personalized items! I think the trivet should be hung above my stove! This is my kind of giveaway! What great products! Thanks for the giveaway. Those are SO beautiful and fun. I have this one bookmarked to remember to order from even if I don't win :D I love giving and receiving personalized items. Sweet! I am heading over right now! That trivet will make wonderful Christmas presents!! THANK YOU for sharing!! You have made my C-mas shopping easier. Several things you have reviewed I am getting for Christmas because they are new (to me) or too cool to pass on!! Personalized trivet's - what a great gift idea! Great giveaway, just in time for Christmas gift-giving! I love their Initial Book Ends. I love their personalized stuff. It's great! I love all these goodies.... so unique!! I would love to have some of those bookends! It's fun to have personalized things!!! :) These look like great products! These would make great Christmas gifts for those harder to shop for people on my list! This is an awesome giveaway. I would love to win this for my sis. Following! What a fun giveaway!! I could use the book mark and so much more! And I have your button! Loved your Halloween outfits! Wow, those look awesome. :) I'd love those bookends for sure! I would absolutely love to give the trivet as a christmas gift. These would be just lovely at my house!! Oh, please do count me in. Thank you! I just checked out the American Personalized Products website--lots of great stuff. I really love the personalized Christmas stocking holder. I folllow on google friend. I would love to win this giveaway. Book ends are awesome. I like them all, but especially the trivet. Great giveaway. I adore all books and book accessories!!! I thought I had already entered! Uh oh...better get to it! I have your super cute button!